In 2022 America, all crime is legal for one night of every year. Unemployment & the crime rate are at an all time low thanks to this annual 12-hour period, known as The Purge, when people are allowed the opportunity to get out all their aggressions. First of all, it actually wasn’t until looking for the images to use in this review that I saw the poster saying “from the producer of Paranormal Activity & Sinister”. I’m glad I didn’t know that beforehand because I’d have skipped The Purge. Luckily, it’s better than those. Paranormal Activity was… Meh. Sinister actually started out very promising and I found it pretty creepy at first but then it got extremely stupid & left me very pissed off. The Purge has the same eerie feel & tension that the start of Sinister has but manages to maintain that throughout the whole film. I’m not sure what to say now. I’m not entirely sure why I liked this film. I went to it only because I heard what it was about and really liked the concept. With so many sequels and remakes and the rehashing of the same old stories over and over again these days, it was great to hear about a movie plot that felt like a fresh new idea (although I’m sure it’s been done somewhere?). All crime legal for one night- It’s a great concept for a film! Very simple yet with SO many possibilities. There were so many ways this movie could have played out. Is it as good as its concept? No, unfortunately not. It tries to demonstrate the (obvious) moral implications involved in people going around and doing any horrible thing they desire for one night each year. But it never really manages to be “deep”. The Purge feels like a wasted opportunity – a high concept that’s not explored in depth. However, I did still enjoy it. I mean, it’s only 85 minutes and it’s from the producer of Paranormal Activity & Sinister – you’re not going to get something too deep & meaningful. As long as you don’t go to it expecting that, you might enjoy it. It’s a popcorn movie that happens to have good original concept. I think this is one of those that’s easier to discuss by breaking it down into the “good” and “not so good” bits. – The creepy masks & the “baddies”. I’m not going to go into the plot too much as I try to keep my reviews as spoiler free as possible. The trailer gives away a lot more about this movie so I can say the story centers on one family (Ethan Hawke & Lena Headey and their son & daughter) in their secured home on the night of The Purge and the people who are trying to enter their house. The masks were creepy. There’s just something about faceless strangers committing acts of evil – I find that frightening. Yes, it’s VERY similar to The Strangers, which I liked but I know not everyone did. 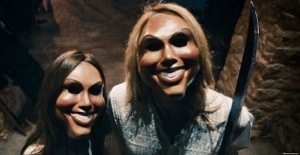 If you liked that, you might like The Purge. – The doll’s head. It’s creepy. What’s creepier than people in masks? Freaking DOLLS. – The “haves” vs the “have nots”. Naturally, in a future where a night of legalized crime exists, it’s those who have the money to arm themselves and secure their homes who have the least to worry about. Again, though, this is something that could have been explored more fully but I thought they did a decent enough job of getting this point across in 85 minutes. – The suspense. It’s pretty good through the whole film. Things are always pretty tense. – The boy looked like Skrillex. Especially when wearing his glasses. (Can’t find a picture with the glasses). – A few things were WAY too obvious and predictable. But I can’t discuss them without spoilers. – The daughter is unnecessarily in her school uniform (with the shortest school uniform skirt EVER) the entire time. (And the male readers are now wondering why this is listed under “not so good”. Lol). Because, like the underwear scene in Into Darkness, it doesn’t make sense. There’s no reason for it. – The characters of the central family & their neighbors. They just came across as very “sheltered” from the realities of the nights of The Purge (other than the son who actually questions things a little). I know the point is that they’re rich so they don’t have to worry about it. It’s not their “problem”. But this is only nine years from now. It just seems a bit weird that The Purge has been so readily accepted as a necessary thing. It just didn’t feel QUITE like how people would actually behave if this was reality. (But the scary thing is that I may be wrong). I think this movie probably would have worked a bit better set a little further into the future. – The genre.The feeling that the movie doesn’t quite know where it “fits”. Thriller? Horror? Science fiction? I just feel like, in the right hands, this concept could have been turned into an absolutely brilliant film. It makes me wish the central idea could be reused and turned into a suspenseful thriller that also explores all the moral issues. Done by David Fincher? I think he could make something great out of this. Christopher Nolan? Heck… Maybe even Lars Von Trier – he’d make something interesting out of this concept. (Look at me trying to sound like a smart film person – I think I’ve only ever seen one Lars Von Trier film. Lol!). Cronenberg might be a good one too… Oh, he’d make an awesome movie out of this. Dammit – I want someone to completely remake this now! 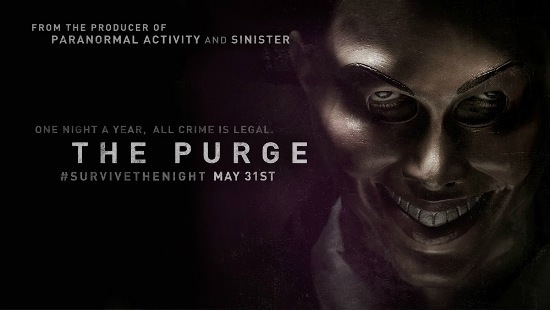 The Purge is a movie with an excellent concept that’s never fully explored in depth. It feels like a bit of a wasted opportunity but is still enjoyable enough as a simple 85 minute popcorn flick. There are moments that are actually pretty tense & frightening and I stayed gripped until the end. It doesn’t quite know which genre it’s aiming for or maybe even what kind of an audience it’s aiming for, though. Some will like it, some will hate it. I enjoyed it quite a bit even though I was a little disappointed when thinking about how great the movie COULD have been in different hands. I wouldn’t recommend it to everyone but I would if I thought it was someone’s sort of thing. But I’d definitely recommend going to it with an open mind and not expecting to learn anything deep and meaningful about the human condition that we don’t all already know. **Rating upped after watching the final film, The Purge: Election Year, as I think this is a very solid trilogy & the first two films have gone up even more in my estimation. Terrific review, I wasn’t so sure about this one but I think I’ll end up checking it out. You’ve persuaded me haha ;). Hehe. Good… I think? It’s definitely not for everyone. A very hard one to know who to actually recommend it to! Well, I do enjoy my horror flicks. Seen every possible one I can get my hands on from Martyrs to Cabin in the Woods, so I think I’m fairly well-versed in the genre. So, would you recommend it to me ? :). Seems a bit tame. Well, maybe a bit tame for you then, actually. 😉 It’s a bit closer to the thriller genre than horror… Put it this way: I was able to handle it & I’m a total wuss! Sounds interesting. I saw the trailer the other day and was quite curious. Think I might very well check it out. When I first saw the trailer and read about the concept, it literally kept me up at night thinking about what I would do in that situation. Sounds like it probably doesn’t go to all the places I went in my head. It’ll probably disappoint me, but I still kind of want to see it. Yeah, I don’t think they put all that much thought into the possibilities! It’s worth a watch but it’s nowhere near as good as it could have been. It’s worth a watch but not one I’d necessarily say you need to rush to see. I had to look up The Trigger Effect. Sounds interesting! But also a bit like that show Revolution (which isn’t that great, unfortunately. Another wasted opportunity!). Great review. I was on the fence about seeing this one. Think I might check it out if I get the chance but I won’t be too bothered if I wait to rent it. Thanks. 🙂 Yes, it’s not one I’d say you need to see in the cinema. More of a renter! Thanks. 🙂 Yes, it’s one you can wait to watch on DVD. It’s just okay. That’s a boy? Stop it. I know. I don’t know about these 2022 boys & their long hippie hair! Back in MY day, the boys looked like boys & had… Oh wait, they looked like members of Poison & Mötley Crüe in my day. Nevermind. I was more of a Winger kid. This is one you can definitely wait to see at home. I do like Ethan Hawke as he’s of my era but he’s a bit weird in this… He needs to stick to Richard Linklater movies. Yeah – if you hated The Strangers, you might want to skip this. 😉 Although it’s not strictly a “horror” movie in the way that one was… But the masks do creep me out. Great review…It’s on my watch list, but now I’m reconsidering. Insidious was ridiculously terrible, so thats quite off-putting. But the trailer looked promising, so I may just give it a go! You’re definitely right about the high concept being the main selling point… once they get into the movie itself, it is kind of blah. Still, it was cool enough that I enjoyed myself too. I know – that robot was kind of cool. Added a bit of creepiness. It was very “Sid toy” from Toy Story! I really wanted to post a picture of it but couldn’t find one anywhere – think they’re keeping that bit of the movie secret. Good review! We share many of the same opinions on this movie, except I didn’t notice the Skrillex thing, that’s awesome lol! !